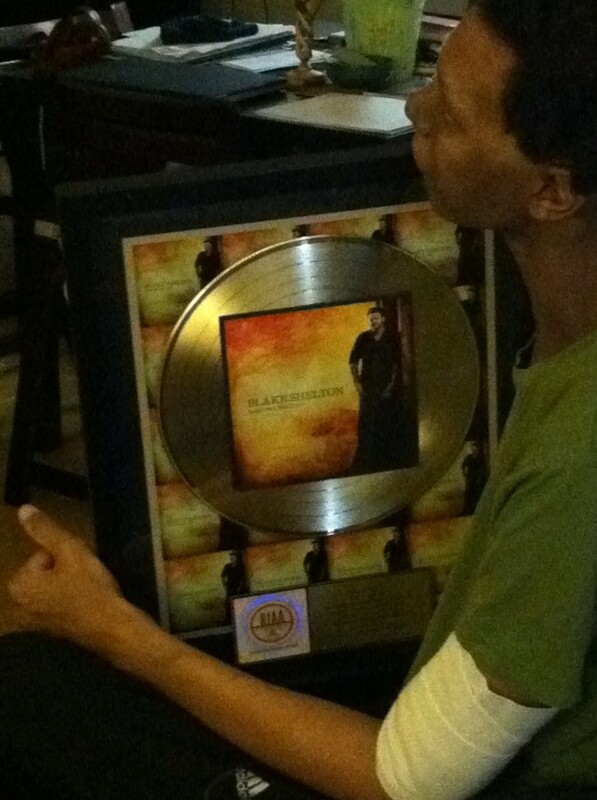 #GoTeamGray » Will’s Song Goes Gold! 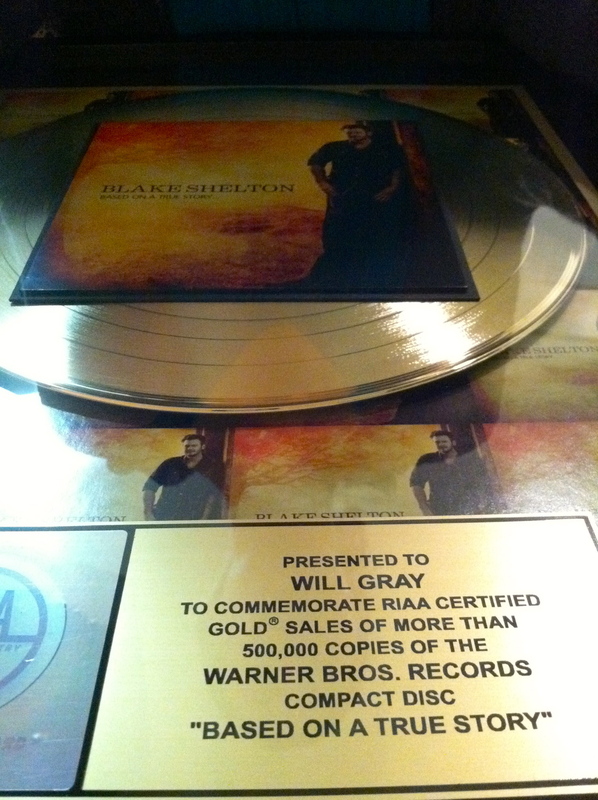 It’s official — Blake Shelton’s latest album, “Based on a True Story”, is now certified gold. That means that over 500,000 people now have a copy of Will’s co-written song, “Do You Remember?” in their hands/iPods/etc. The news visited Will and Angie earlier than the public, and below are some pictures from that presentation. 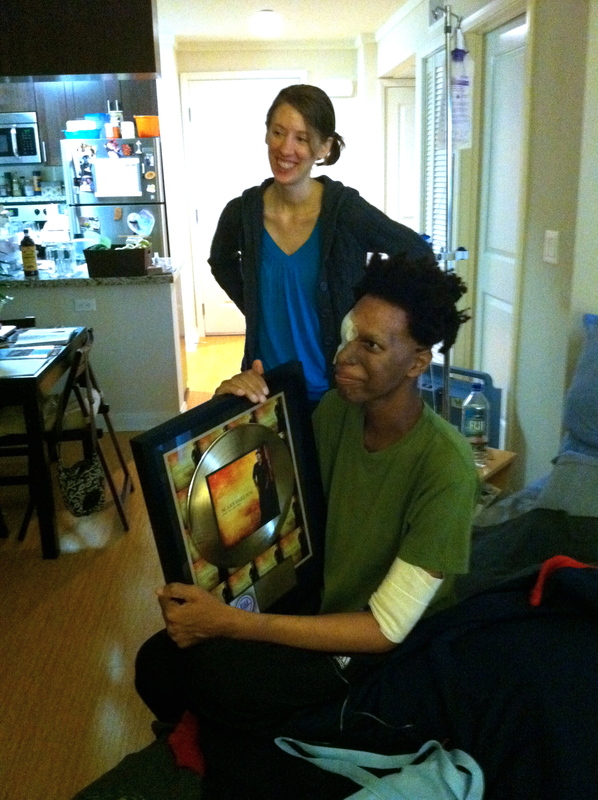 We’re confident this is the first of many gold records for Will, and are thankful for the chance to celebrate this achievement in his professional life. Many in our #GoTeamGray network already know the immense musical talent Will possesses. We love seeing it recognized in the mainstream musical world! #GoTeamGray celebrates with you, Will. Many, many congrats. And here’s to many more. 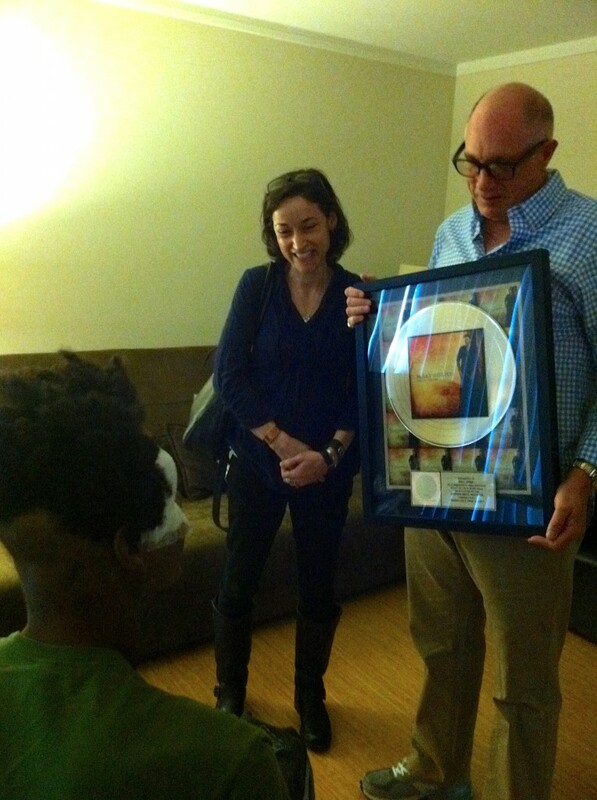 Will & Angie receiving the Gold Record! Praying for your next steps as you head to AZ. AMAZING! Congratulations Will and Angie – what an incredible accomplishment. You have both worked so hard to achieve this – amazing to see this happen. thinking of you both often. God Bless u sn Angie so. Will i want congtats to u and wishing u well. U have been a greatt inspiration to me. I am very pround of u. Yours and Angie faith has open my eyes alot. Hang in there keep praying and i will continue praying for the both of u.
Congrats, Will. Praying for you every day. Love you. CONGRATULATIONS, WILL! ‘Do you remember?’ is so sweet it brings tears to my eyes. Rejoicing with you and Angie in God’s tender mercies and thanking Him for the ways in which He is using you to bless so many, myself included. Praying for you and for His glory in all things! Congratulations, Will! I’m so happy that your talent is being discovered by so many who are hearing your music for the first time! God’s hand is definitely in all of this. I love you! Congratulations, Will! I’m so happy that your talent is being discovered by so many who are hearing your music for the first time! God’s hand is definitely is all of this. I love you! co-written on, working hard to get you more of these! Keep fighting, Will! And please enjoy this moment! Great Job Will with the gold record!!! I am praying for you every morning and at night I know God is hearing all of us who are praying for your recovery and good health. You are part of my every day prayers to God. Angie, keep up the loving care you are giving to Will God will bless you also. You both are part of my heart. God is listening to all of us who are praying for both of you. I have been enjoying all of Will’s music for the first time after joining Team Grey. Bought everything I could find on iTunes. His talent astounds me. Not to mention that I feel so much cooler when I listen to it. What a privilege to know of you, Will. Congratulations!! Proud of you Will! That song is so beautiful! Keep shining. I don’t know if there is a more beautiful person than Will Gray :) He shines Jesus! Such a great accomplishment. Congratulations Will I stand with many people in your hometown Paris, Tennessee who are very proud of you. Tony and I are thrilled for you, Will! Imagine all the people who are listening to your song! We haven’t heard it yet, but we’ll be buying the CD and paying you a royalty! God’s mercies are new each morning. We continue to pray that He would shower you and Angie with endless mercies. Well done brother.. FYI: Mithila has been a Blake Shelton fan since day one. She has become an even bigger one now.. Prayers still going up for you, Angie, and both of your families. So happy to hear this news! What an incredible, tangible acknowledgment of your wonderful talent. I’m very excited for you! Enjoy the moment! Ahh! I love it. So good. Love the song. Love the kudos you are getting, you deserve them all. I can’t wait to hear more of your music. It is so incredible, beautiful, and powerful. Love you both so much! Will ,you are awesome!!! Thank you for sharing those beautiful pictures. What a tremendous honor. Your song is great and you deserve the recognition. Angie, you are awesome too. Your support and input is duly noted. You both look great. Always praying for you and sharing your story with others. Prayer support is growing daily. Watch, stand fast in the faith , be brave, be strong. 1 Tim 16:13. Thanks to God for this incredible joy! Praying for you and those caring for you.